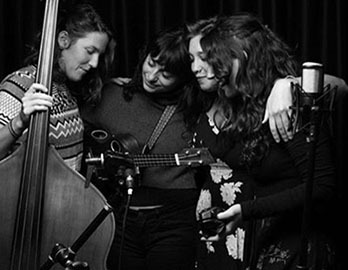 The four women of Ley Line transcend language and genres to create dynamic harmonies through textures of standup bass, guitar, ukulele and percussion. Raised on the North American traditions of blues, folk and soul and inspired by its members’ world travels, Ley Line’s multilingual performances blend rhythms and influences from Brazil, Latin America and West Africa. The musical merging of two duos, Ley Line’s Austinites Kate Robberson and Emilie Basez met twin sisters Madeleine and Lydia Froncek at the Telluride Bluegrass Festival in 2013, forming a band two years later in Austin. Through instruments and voices, music and storytelling, tradition and innovation, the band celebrates cultural and linguistic connection. Ley Line is a part of a growing movement of self-managed artists supporting sustainable and intimate touring practices, engaging with local communities through music and outreach with schools and grassroots organizations, and offering workshops and interactive performances to promote cultural appreciation among diverse populations. They have partnered to support non-profits including Girls Impact the World, The Amala Foundation, Fuel our Fire, GirlForward, and Casa Marianela.